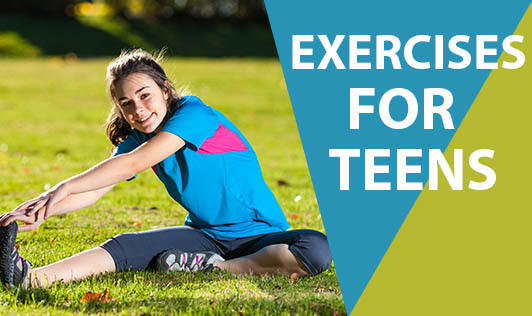 If you're a teenager, you may be confused about what kind of exercise to do to get stronger, stay healthy or, lose or gain weight. According to studies, aerobic exercise is considered perfect for teens. Some possibilities include running, skating, cycling, swimming, power- or race-walking, tennis, full-court basketball, aerobic dancing, kick-boxing, hockey, soccer, rowing, elliptical trainer, jumping rope and handball. If you've attained puberty, your body will have begun making the hormones necessary to help you build muscle in response to weight training. Children younger than 17 years of age should not be lifting weights, certainly not heavy ones. It's very important to make sure that when you are lifting weights - either free weights or on a machine - that there's always someone nearby to supervise, or spot you. This person can not only encourage you, he or she can also act as your coach, telling you if you're not doing a particular exercise correctly. Walk, bike or skate to and from school, if that's an option. Ask your parents if you can go to a local community center if there's any, where you can exercise. Create a new routine where you walk, skate or run every day when you get home from school or before dinner. Do some chores at home. Remember that any activity that gets you moving will work, so start with something you like and focus on having fun.